Take out an EasyFlow Maintenance Plan between July and September and receive three months cash back! Our Maintenance Plans are designed to ensure our customers enjoy peace of mind, and constant hot water. We keep your hot water flowing while minimising your costs and eliminating stress. Let our experts identify and correct water heater faults, while you enjoy low monthly payments. The minimum term is 12 months. To claim this offer you must quote Offer Reference SAVE25 when making completing the application form. Applications must be received and direct debits in place before the end of September 2018. To find out more, click here Maintenance Plans. After weeks of trying to find a company that could fix our specialist electric boiler, Easy Flow managed to succeed. Lisa, on the phone, and Chris, the engineer, were both extremely friendly and helpful. It is great to finally be able to have a hot shower. We would highly recommend. I had a 10 year old electric combi-boiler that stopped working, right when the cold weather started. Easyflow came out and got it started, then arranged for the faulty switches to be replaced. Fantastic service!! Excellent service from start to finish. Appointment was easily booked with Lisa; received emails to confirm, and a text when Chris the Engineer was on his way. He immediately identified the issue with my old Megaflo cylinder and fitted a new cold water combination valve during the same visit, price was very reasonable. Lisa made a follow-up call a couple of days later to check everything was OK, am going to sign-up for their maintenance plan for total peace of mind. Would 100% recommend EasyFlow to family and friends. Always friendly, great service and reliable. Would highly recommend. Helpful and Friendly Team with a great service. I would highly recommend the company as I have had an effective and reliable service from them whenever needed. Excellent service. 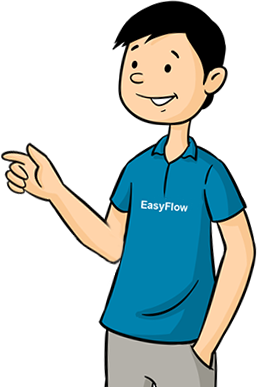 We've used Easyflow for 6 years and are very happy with the service provided by Chris. Thank you for your efficient and friendly repair to my daughter’s boilermate. I look forward to using your company again should the need arise. I was really pleased with the service today. the engineer was on time, ( doesn't always happen with tradesmen) add very effective. I was pleasantly surprised when he went back to get extra parts to finish the job there and then, to avoid further delays. He was polite, helpful, and worked very efficiently.